Gentle plant-based cleaners and skin conditioners cleanse skin without stripping away natural moisture. Leaves all skin types fresh, hydrated and healthy-looking. *Grapefruit Scent - Say goodbye to the mid-afternoon blahs with the refreshing and unforgettable scent of grapefruit. Use: Squeeze body wash into wet loofah, washcloth or hands. Work into lather over skin, then rinse with warm water. 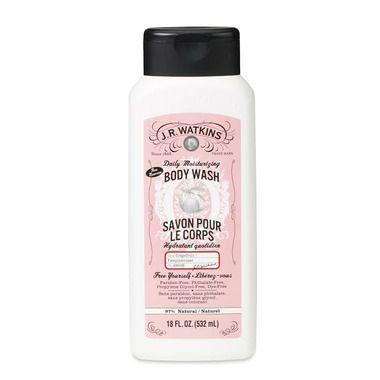 I LOVE JR Watkins products and just bought this body wash for the 1st time. I LOVE IT! I'm totally hooked!! It has a lovely mild scent and washes up great. I really enjoy the fresh grapefruit scent and rinses nice and clean. I can feel good about the ingredients too! Pretty scent but does not wash that well. Would be ok with a bubble bath wash but definitely doesn't do the trick after any physical activity - especially a gym visit. This mom who spends her days chasing two little boys, won't buy again.